Blood and/or Japanese yen are commonly used as wagers with a conversion rate of 100 ccs of blood equaling 1,000 points. This gameplay section assumes you know the basic rules of Japanese mahjong. Chow: Claimed from the player to your left or for mahjong. Pung: Claimed from any player. Kong: Claimed from any player. A replacement tile is drawn afterwards. Another tile in the dead wall if turned face up to reveal the kan dora. Concealed and Small Melded Kong: Announced only after drawing a tile (i.e. not after claiming a tile). A replacement tile is drawn afterwards. Another tile in the drawn and placed aside as the indicator for the kan dora. Discards are placed rows of six in front of the respective players' wall. Tiles claimed are rotated 90 degrees within the set to show which player had discarded it. 3-character is claimed from the person to our left. 5-dot is claimed from the person across from us. Concealed kongs have two outer tiles face up and two tiles face down. This is the distinguish concealed and exposed kongs when scoring. A concealed kong of 3-dots. The dealer wins the current hand or earns points for tenpai (one tile away from a complete hand) he/she deals again, retaining the East position, otherwise the deal passes. The hand ends in draw the deal passes to the player to the right. A round is over when all players get a chance to deal. If a primary player makes a tsumo or acheives rons off the opposing primary player, payment is made immediately. The winner can (re)claim payment either in money or blood. After the round is over the prevalent wind changes. The order of the winds are East and South. 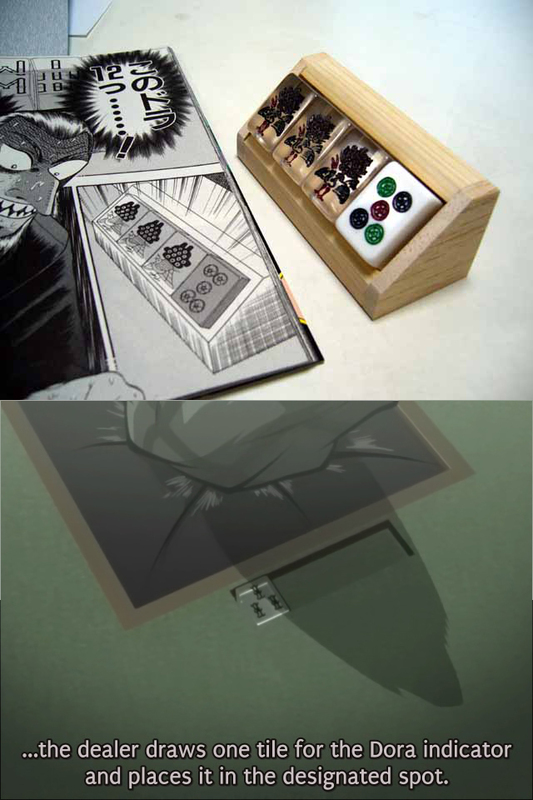 If a draw occurs any player who is tenpai can show their hand. Players who are noten (not one tile away from winning) have to pay a total of 3000 points to players who are tenpai. For example, Player A is in tenpai whereas B, C, and D are not, Player A receives 1000 from each player ($1000 \times 3 = 3000$). A 100-point counter is placed to the dealer's right-hand side. Nobody wins after four kans are declared. All four of the same wind tile is discarded within the first go around. A player has nine different terminal and honor tiles within the first uninterrupted go around. Four player's declare riichi. Hands are shown if nobody can win on the last discard. Under these conditions the noten penalty is not applied. A 100-point counter is placed to the dealer's right-hand side. A counter is placed on the dealer's right-hand side after a draw or after East wins. Each counter increases the payout to the winner by 300 points. In case of a self-drawn win each opponent plays 100 for reach counter. Counters are removed when another player declares a win. When there are five or more counters on the table a minimum of two yaku are need to win. If the deal passes the previous dealer's counters are returned and the new dealer replaces the counters with the appropriate amount. Riichi bets are collected by the winner. Should a draw occur the riichi bets remain on the table. The game ends when six han chans are completed, a player loses more than 2000 ccs of blood, or a player becomes bankrupt, which ever occurs first. At the end of each session a scoring adjustment is made to reward the top players and punish the losing players. v • e Japanese Modern Mahjong Series .